This is a copy of letter I have sent to support removing mandatory reporting from Queensland Health Practitioner legislation. I believe that the proposed Health Practitioner Regulation National Law and Other Legislation Amendment Bill 2018 still fails to meet the stated purpose of ensuring that health practitioners have confidence to seek treatment. Rather than clarifying the matter, the ill defined “substantial risk of harm” potential creates more confusion. Who defines this, and if I were to define it as not “substantial” who is to say a lawyer or politician may define it otherwise. This lack of clarity continues to be a barrier to Health practitioners seeking effective treatment. This lack of clarity may cause more harm as earlier interventions may be deferred out of fear of reporting. I believe that Western Australian model should be sufficient for all of Australia. That is, voluntary reports based on their professional and ethical obligations to report matters that may place the public at risk of harm. There should be no distinction between the treatment of a registered health practitioner and that of a patient from any other occupation. Just like all other people in Australia, any health practitioner who becomes a patient should be entitled to discuss their health with their doctor in a strictly confidential environment. A report to AHPRA can lead to a lengthy and stressful wait even if finds no case needs to be answered. Whilst awaiting the result of an investigation and determination, the burden of stress only increases on the health practitioner. Ultimately, the suicide of a untreated health practitioner fearful of a mandatory report, who does not seek help becomes a tragedy for the person, the community, colleagues and the practitioner’s family. This is a real problem in Australia with both young and old doctors taking their lives because of mental health problems. As you maybe aware you cannot always tell a person is struggling or considering suicide by just looking at them. They have to feel that they are in a safe and confidential position to ask for help. This applies to the butcher, baker or the neurosurgeon. Health professional suicide is a world wide problem. Canada, UK, USA, South Africa …. As you may be aware between 2001 and 2012, 369 suicides by health professionals were recorded in Australia. Drs John Moutzouris, Chloe Abbott and Andrew Bryant are just three doctors who took their own life since that data was collected. Tragically there are more. Beyond Blue in 2013 surveyed 12,000 doctors and one third were concerned about seeking treatment that may have an adverse effect on their registration and ability to continue to work in the field they were trained. Half suggested lack of confidentiality was a barrier to seeking help. I again ask Mr Harper that Queensland adopt the Western Australian model to protect the health professionals who serve our community. I am not aware that this model has put the public at risk of harm in that state. 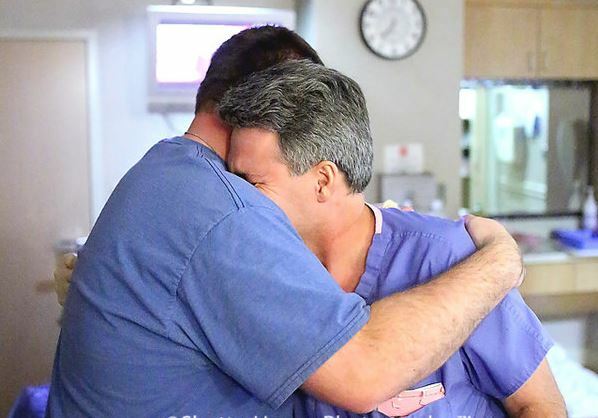 The photo above is a new Dad hugging the doctor who delivered his baby. But I think it shows how much we are all human and we all need the freedom to have a hug and not get reported if we are not OK. If you are in an emergency, or at immediate risk of harm to yourself or others, please contact emergency services on 000, or Lifeline Australia 13 11 14. This entry was posted in General practice, mental health. Bookmark the permalink. It happens in other professions too, in my current profession a person can likewise be de registered etc if disclosing they have a mental health problem, they can lose employment plus the stigma related to poor mental health/mental illness the open disregard for those suffering mental illnesses or requiring support for this in the profession. I have experienced this first hand plus my own family and friends denying mental illness even exists, my father wasn’t convinced even after I made him accompany me to my appointment with a psychiatrist, the psychiatrist explained everything to no avail. My dad still refuses to admit there’s any problem at all or that I require ongoing management and treatment by my brilliant GP who’s been fabulous and supportive throughout from initially diagnosing through to managing on an ongoing basis interventions such as phychology referrals, follow, psychiatrist referral etc for this I’ll be forever grateful.